Honda has unveiled its 10th-generation Accord sedan, showing the world its most dramatically styled version of the perennially best-selling American-built sedan. The new Accord gets longer and wider, features three new powertrains and drops the coupe version in favor of a sportier Sport version that offers a manual transmission with either of its two turbocharged powertrains. On the outside, the Accord looks completely different from any of its predecessors. The new car sits on a 2.16-inch-longer wheelbase, is 0.39 inch wider with wider tracks front and rear, but is about a third of an inch shorter overall. Crisp angles and a bluntly styled front end reach back with strong fender lines to the unusual C-pillar kink, while the taillights are similar in shape to those of the new Civic. The greenhouse is visually moved rearward, giving the car the proportions of a rear-wheel-drive vehicle, but the thick grille and hood suggest a front-wheel-drive model. The Accord is powered by three new drivetrains, two of which are turbocharged — the first time the Accord has been fitted with a turbo engine. The base engine is a turbocharged 1.5-liter four-cylinder making a best-in-class 192 horsepower and mated to either a continuously variable automatic transmission or, if you opt for the Sport model, an optional six-speed manual unit. The upgraded engine is a 252-hp, turbocharged 2.0-liter four-cylinder mated to a new 10-speed automatic transmission or an optional six-speed manual in the Sport model. The V-6 engine is no more, and Honda is hoping that buyers of the two-door coupe will be satisfied with the four-door Sport provided it has a manual transmission. A third powertrain, the next-generation version of Honda's two-motor gas-electric hybrid system, will also be available, but Honda did not provide specifications of that drivetrain's output or efficiency as of publication. Honda did state that it will use a 2.0-liter naturally aspirated Atkinson-cycle four-cylinder engine and motors that do not use any rare-earth magnets, a world first. The packaging of the hybrid has also been improved to the point where cargo and passenger room are unaffected by the system — there's no impact to trunk space or the 60/40 split, folding rear seat. 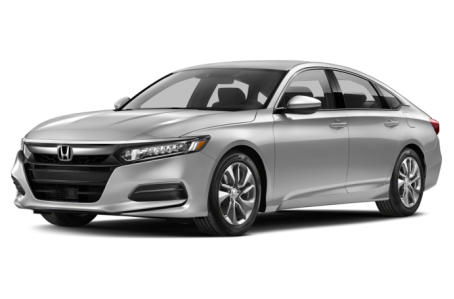 A lot of work went into the Accord's new body structure, as well, resulting in a stiffer, lighter body and chassis that's dropped between 110 and 176 pounds, depending on the trim level. A MacPherson strut suspension setup continues up front, with aluminum control arms mounted to an aluminum subframe. The rear uses a multilink design mounted to a floating rear subframe. All Accords will come standard with an adaptive damper system that adjusts shock-absorber force every 1/500 of a second for improved ride and body control. Accords will also feature a two-mode driving system, which allows the driver to switch between Normal and Sport modes. The system will adjust several vehicle parameters, including electronic power steering effort, throttle response, transmission shift points, active damper settings, and even the artificially produced engine noise to change between a more sedate and a more sporty feel. The cabin of the new Accord is more spacious, with a lower beltline and A-pillars that are 20 percent thinner and further rearward than the current model, all contributing to improved outward visibility. Passenger room has increased overall by 2.5 cubic feet, while the trunk gets almost 1 cubic foot of additional room. Backseat passengers get nearly 2 more inches of legroom as well. A new 12-way adjustable power driver's seat is available, while heated and ventilated front seats are also offered. Soft-touch materials abound, with a new dashboard design that incorporates a display screen in the tablet style that's becoming increasingly popular with automakers these days (love it or hate it). The 8-inch Display Audio screen is high-mounted and clear, and it features both a physical volume and tuner knobs that should finally shut everyone up about how unpleasant Display Audio can be to use without such knobs. Apple CarPlay and Android Auto are offered, as is the next-generation of HondaLink concierge services now featuring emergency roadside assistance, remote lock/unlock and engine start, stolen vehicle tracking, remote diagnostics, geofencing and more. Opt for the Touring trim level, and you'll get a 6-inch head-up display projected onto the windshield, reconfigurable to include speed, engine rpm, navigation and traffic sign recognition. All models will feature at least one USB port, with the EX trim and above featuring a pair of 2.5-amp ports. Audio systems range from the four-speaker, 160-watt system on the base LX, eight speakers and 180 watts on Sport and EX, and 10 speakers pumping out 450 watts on the EX-L and Touring models. Honda is equipping every Accord model with the Honda Sensing safety suite as standard equipment, which includes some surprising driver-assistance technologies. The system includes collision mitigation braking, lane departure warning, adaptive cruise control with low-speed following, road departure mitigation and traffic sign recognition. Optional is the ability to add in blind spot warning, front and rear parking sensors, driver awareness monitoring and cross-traffic monitor. A backup camera with dynamic guidelines is standard. Six trim levels will be available for the Accord 1.5-liter when it launches in the fall of 2017: LX, Sport, EX, EX-L, EX-L Navi and Touring. If you want the bigger 2.0-liter engine, four trim levels will be offered: Sport, EX-L, EX-L Navi and Touring; the hybrid model will also have four trims, replacing "Sport" in the latter lineup with just "Hybrid."